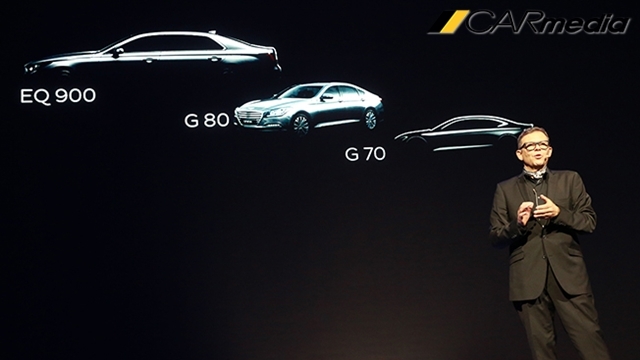 Initially when Hyundai release the new brand we were given an list of 3 cars that are soon to come out for the public, in those were the G90, the G80 and last the G70. The G90, also known as EQ900 in Korea, was unveiled in December 2015 in Korea presenting the first model for the Genesis brand and should be ready to hit showroom by this summer. Then we have the G80 which was shown at the Detroit Autoshow this year and we can also expect this model for the summer time with a light facelift. Following these two models, Genesis should be releasing the G70 but before that they decided to show a new concept model that should be the G70 inspired to, and its call the New York Concept that was shown at the New York International Auto Show. Hyundai also told us they are expecting 3 more model for the Genesis brand, 2 of these are luxury SUVs and, what everyone is waiting for, the Sport Coupe. At this point is all about the waiting game and speculate when we are getting these models but thanks to this picture now we can mark our calendars and start saving our money. 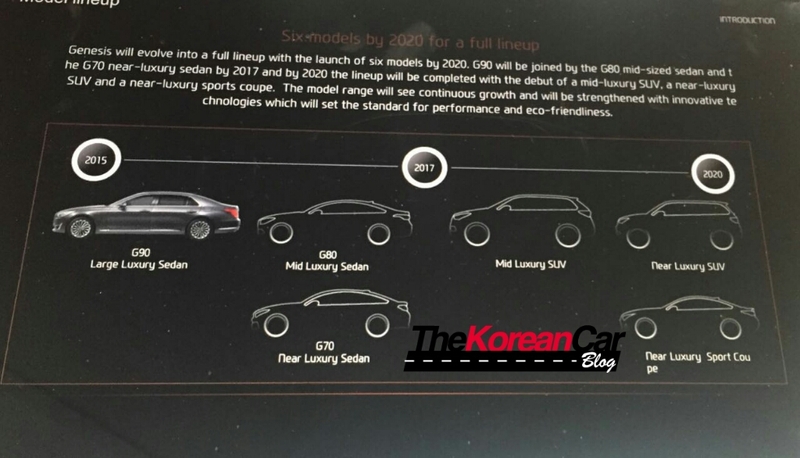 This picture tell us that the first car to roll up is the G90 which some dealer are receiving some Demo cars for their showroom, next is the G80 in which Hyundai already showed us the production version of this model and by 2017 we should expect the G70, so can you guess which Autoshow Hyundai will choose to unveil their new model? Not too far from the 2017 margin is followed by the Mid-Luxury SUV and we are thinking along the Santa Fe size, so maybe by 2018 we will get to see this new SUV. Now before 2020 we get the near luxury SUV, possibly along the Tucson size full filing the SUV line up but that’s not all because then we are getting the near-luxury sport coupe. One thing youll notice, they are not calling it G70 Coupe so more than likely it might not look like the G70 and it’ll have it’s own design. If we follow the pattern of what they did with the G80 and G70, it seems that the near luxury sport coupe can be expected by 2020 and that will leave lots of car enthusiast waiting. Some of you might notice but the Genesis Coupe model has stopped at the 2016 year in the Hyundai USA website and if you look at the Korean website, the Genesis coupe is no longer listed there. We haven’t heard confirmation from Hyundai if the Genesis coupe has been discontinued but we send them an email to confirm this. If that is the case, car enthusiast might have to wait 4 years before we see another sport coupe. So are you guys willing to wait 4 years for another sport coupe from Hyundai/Genesis? And if so, what specs you want it to have?